A widening gap between South Korea’s large, export-oriented companies and its domestically focused smaller enterprises, in terms of both earnings and employment, highlights the need for a pro-corporate policy across the board, economists say. Under these circumstances, the economists argue, imposing tighter restrictions on large conglomerates to achieve what the Moon government describes as “a fair economy” will ultimately shrink corporate tax revenues and diminish job opportunities. According to the tax authorities, the country’s 500 largest companies, or 0.1 percent of local firms required to submit tax returns, earned more than half of all corporate income last year. They accounted for about 63 percent of corporate taxes collected in 2017. By contrast, more than 44 percent of small and midsized firms failed to make interest payments with their operating profits last year. Large companies are planning to increase hiring in the second half of this year, while most SMEs are cutting their payrolls to cope with rising labor costs. A recent survey of the country’s 20 largest business groups showed they had plans to hire more than 30,000 college graduates during the fall recruiting season. But the corresponding figure for the 571 SMEs surveyed was only 2,932, far lower than the 7,659 recorded a year earlier. Regulators within the Moon government appear to be under pressure to address the polarity between large, profitable businesses and faltering smaller firms. Many economists, however, have expressed concern that tighter restrictions on large companies would only exacerbate the difficulties in the national economy, particularly in the absence of appropriate regulatory reforms to boost corporate activity. “Economic conditions will continue to worsen if (the government) keeps treating big businesses as foes,” said Yoon Chang-hyun, an economics professor at the University of Seoul. He called on the government to be active in pushing for deregulation and other business-friendly measures to incentivize large companies to increase employment and investment. A small number of large manufacturing firms helped boost the country’s outbound shipments to a record high of $297.5 billion in the first half of this year. Exports have bolstered the country’s economy amid sluggish investment and consumption. But there are concerns about Korea’s heavy reliance on semiconductor exports. Economists say the Moon administration should ditch its income-led growth policy accompanied by pro-labor measures, including steep minimum wage hikes, which they note are placing especially heavy burdens on small and midsized companies. Critics have accused the government of squandering taxpayers’ money to help small-business owners cover the increased labor costs incurred by its misguided policy. 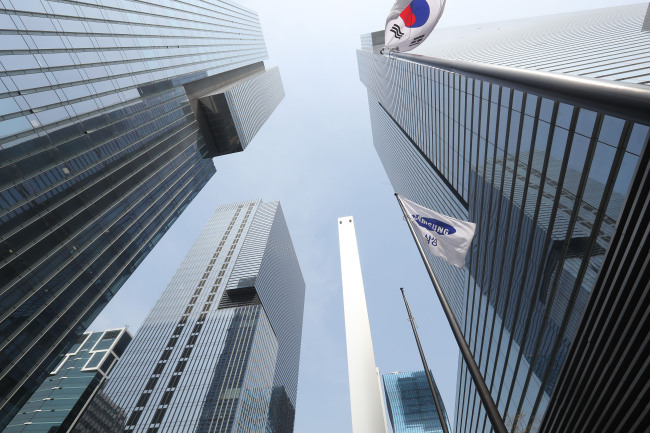 Reflecting their deepening woes, the number of SMEs and venture companies put on sale through the Korea M&A Exchange jumped 44 percent from a year earlier to 360 in the first half of this year. Officials with the institution estimate that the number will exceed 700 by the end of the year, compared with 538 last year. But it is becoming harder to find purchasers amid deteriorating business conditions. The worsening business environment at home has pushed local companies to move abroad, with overseas direct investment reaching a record high of $42.7 billion last year, according to data from the Export-Import Bank of Korea. Small and midsized companies are generally more active in moving production to other countries. While overseas investment by large corporations rose 38 percent over five years to $35.3 billion last year, the corresponding figure for SMEs jumped three times to $7.4 billion over the cited period. The exodus of manufacturing firms is expected to accelerate next year, when the minimum wage is set to increase 10.9 percent to 8,350 won ($7.41) per hour following a 16.4 percent hike this year. Lee Byung-tae, a business professor at the Korea Advanced Institute of Science and Technology, said small and midsized firms tend to be more sensitive to the impact of labor costs, as wages account for a greater proportion of their overall costs. The growing number of jobs shed by SMEs will severely aggravate local employment conditions, given that they hire about 87 percent of workers in the country. The proportion is far higher than corresponding figures for other major advanced economies -- 41.3 percent in the US, 52.8 percent in Japan, 53 percent in the UK and 63.3 percent in France, according to data from the Organization for Economic Cooperation and Development. Economists say it is necessary to focus on enhancing the competitiveness of large and small companies alike by forging a more business-friendly environment through regulatory reform, tax incentives and the readjustment of misguided policies. “Growing risks from anti-corporate policies have spread the perception that it is difficult to do business here,” said Kim Yoon-kyung, an analyst at the Korea Economic Research Institute, a private think tank. Sohn Kyung-shik, chairman of the Korea Employers Federation, said in a recent interview with a local daily that the coming five years would be a critical period in deciding whether Korea remains an industrial powerhouse. He called for efforts to strengthen the competitiveness of traditional manufacturing industries and nurture new growth engines in keeping with changes in the business environment.